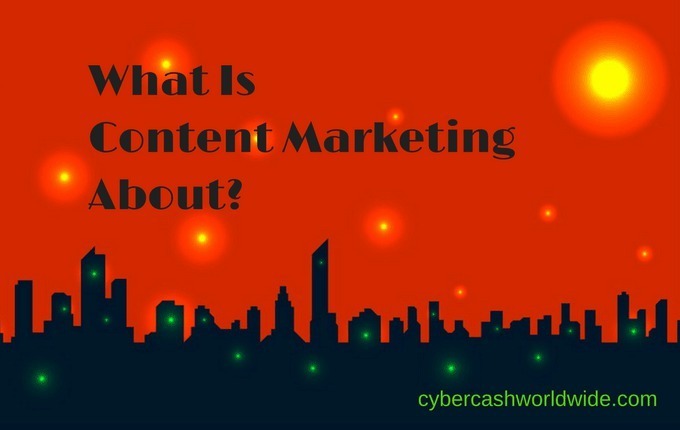 >> What Is Content Marketing About? What is content marketing about? It's about decent way of marketing. That's all it is. It's almost any methods that smart marketers would use. They don't want to appear sell-y, so they pretend they're not selling. But they are selling. That's content marketing. 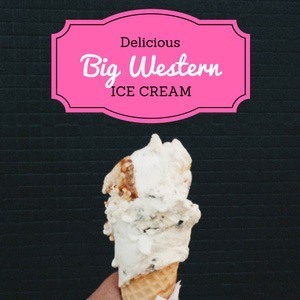 ​This Big Western Ice Cream is soooo creamy. The best in the world! Ummmm, yummy. Get it now while the stock last! Only available until Thursday, otherwise it will melt away. So hurry up to get our delicious Big Western Ice Cream! That's not content marketing, because there's no quality in the context and no one would believe you. If you simply kept on doing it this way, no one would trust you ever again. So what do smart marketers do? They help people by solving problems. People are forever looking for solutions and when they find one, trust it and buy it, then that's a successful content marketing. Get People To "Consume The Content"
Content marketing can be in an article format - websites to start with. Books, magazines and newspapers. By audio or visual - podcasts, YouTube. Or manga comics probably? Infographics?​ As long as there's a "content for people to consume", trust the content and buy the targeted product/service. Do smart marketers really pretend that they're not selling? No, that's not what I actually meant. You believe in Big Western Ice Cream, right? You think it's one of the best. All you really want to say is "Ummm delicious. Buy it!" But that would hardly sell, so you have to be a little tactful. There are two ways to sell; either brainwash others without content, or throw the ball in their court and let them find out (consume) what the ball is about. The former is "Umm delicious" method by making it tantalising and irresistible, e.g. using graphics or a famous model. And the latter is to a content marketing, by using a valuable information. A product review or comparison is a typical one. You don't care what the ice cream is made of, you just love it and you think it's one of the best. But how else do you do to convince others to buy it? You're having to find out the ingredients and the manufacturing process in order to fill up your advertising space. So that you can sell it. But you'll say it's an ice cream review, not an advertisement. If you need a proper explanation about content marketing - Content Marketing Institute defines what it is much more in detail, and they also give you 75 examples to download if you sign up with them. Content marketing is a strategic marketing approach focused on creating and distributing valuable, relevant, and consistent content to attract and retain a clearly-defined audience - and, ultimately, to drive profitable customer action. Your credibility - how you appear to be trustworthy can define your sales technique in content marketing. How you sell products or services to others is essentially how you sell yourself therefore your skill is exposed accordingly. We all have different personality and our own strategies. While content marketing method may not be for everyone, some are fabulous at just expressing "Ummm delicious" rather than using 1,000 words, you know? Apple, for example. For the last 15 years I've been purchasing a new Mac computer every few years and, perhaps apart from my first iMac, not once have I relied on reviews to decide whether to purchase the new model or not. It was the ad in Apple website that wowed me every time and urged me to buy it. Simple. That's a successful result from a non-content marketing. Towards me, at least. Social media is probably a typical platform for non-content marketing. Twitter for example in the limited number of characters, emotional market value (EMV) of the headline, hashtags, attached images and the time of the post can determine how it sells. Instagram does not allow you to place a direct hyperlink in the post, and naturally the photo or video clip says it all. Social media marketing is certainly an easy, handy option but each post has such a short lifespan, quickly buried in millions of other posts/tweets barely noticed. So taking a "decent option" - create materials that stay semi-permanently and the value of which is appreciated by the visitors - is essential for most of us. To me video marketing is a high hurdle to jump, as I feel 1,000 times more comfortable writing than speaking to the microphone. I have tried it a few times and personally find it too time consuming. Always come up with new thoughts as I speak, re-record and spend days in editing afterwards. But my online marketing mentor, Rick Bell from Rick-Bell.com suggests that I should make myself carry on. ​Everyone starts from zero, so did Rick. The beginning of his video tutorial career, he created over 100 clips in a short period of time, none of which he was happy with, but did help him gain confidence. By being able to present yourself, not only you'll find new audience but the level of your authority and credibility will boost. So "speak to the camera periodically, whether you publish the clips or not, it's good to load the gun now and learn to shoot later". Well, that's what he says to me and it does make sense. But broadcasting your voice is a totally different area where your spontaneity is challenged, comparing to blog posts. The way the audience digest the information is quite spontaneous too - although audio/video can always be rewound and replayed, the pace of the delivery is the pace of receipt by the audience. 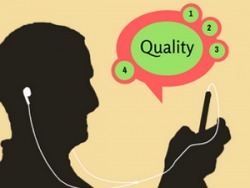 Whether web posts, podcasts or YouTube, each platform provides different type, depth and overall quality of content, and received by the audience differently. J﻿oin us ﻿﻿﻿﻿FREE﻿﻿ and learn how to make money online by content marketing.